Perfect with low carb spreads or all alone! Combine all ingredients, and enough warm water to moisten completely. Cut parchment paper the length of the cookie sheet you will be using, and place on clean surface. Place dough ball on the parchment paper and press down. Cover with another sheet of parchment paper. Use a rolling pin to roll out dough, very thin into a rectangle or square shape. Place the dough and parchment paper on the cookie sheet. Remove the top parchment paper carefully to not tear the dough. 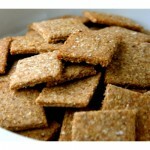 Using a pastry roller, cut into squares the size you want your crackers. Bake in a 400 degree oven for 12 minutes. 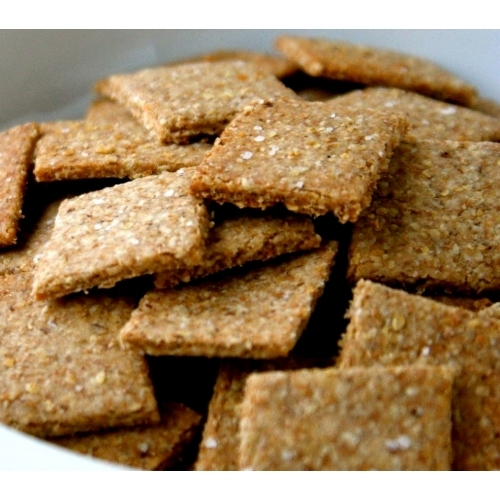 Remove crackers that have browned and continue baking the remaining crackers for an additional five minutes or until browned.